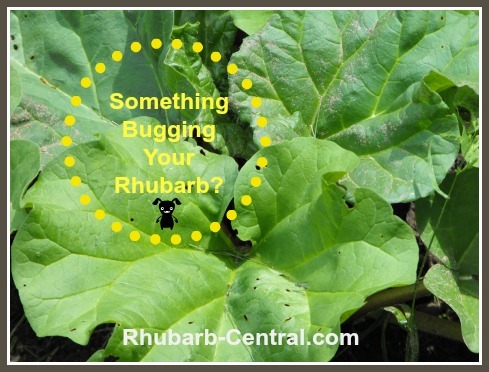 Rhubarb Pests are not usually a common problem for the rhubarb gardener. Rhubarb is a hardy and resistant type of plant, and not bothered by many pests. There are, however, a few pests which are known to feed on the rhubarb plant; these, and how to control them, are discussed below. Scroll down for answers to specific pest problems. I have rarely (over 25 years!) treated my rhubarb plants for pests. 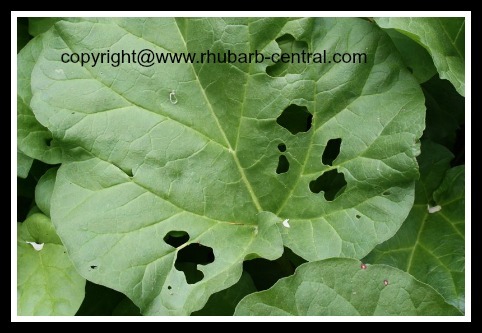 The leaves are often dotted with holes, but they are discarded when the stalks are harvested, therefore, unless there is a major infestation of rhubarb pests (that are also affecting the stalks of the rhubarb), I usually do not treat the rhubarb plants. Similarly, if the rhubarb stalks have a few "scars", holes, or other imperfections, these can simply be cut off and discarded when processing your rhubarb harvest! Remember, it's the stalk you are harvesting, so imperfections on the leaves does NOT mean than you cannot use your rhubarb stalks! To help prevent pests from damaging your rhubarb plants, it is advisable to care for the rhubarb plants in the best possible way to keep them healthy. Cultivate the soil around the rhubarb beginning in early spring. Remove dead leaves regularly, and remove all the leaves and stalks before the winter to prevent rhubarb pests from over-wintering in them. If you compost the rhubarb leaves, it is not advisable to put the composted leaves back onto the rhubarb garden. This will help to prevent returning rhubarb pests to your garden. Also, when beginning a rhubarb garden, consider where you will plant your rhubarb. Gardening with plant companions in mind, is a great gardening concept. With careful planning, you can "help plants help each other" by choosing which garden companions to grow together. In some cases this method of planting can help attract "helpful" bugs or repel "harmful" bugs. Or, companion gardening may assist by the natural addition of nutrients into the soil, keeping plants healthy, and more resistant to pest damage. If you detect a possible rhubarb pest problem in your rhubarb patch, observe the entire plant(s) affected and determine the extent of, and characteristics of the problem. Check the underside of the leaves as well as the tops, and inspect the rhubarb stalks for slugs, beetles, other insects, holes, eggs, webs, and so on. These rhubarb leaves (see photo above) have been damaged by aphids, slugs, beetles, or other insects. This (see photo above) rhubarb stalk (notice the holes) has been damaged, most likely by a rhubarb plant pest such as a Rhubarb Curculio Beetle, or a Potato Stem Borer. 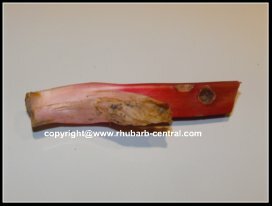 This rhubarb stalk (see photo above) has "scarring" damage, most likely caused by slugs, or other rhubarb pests. 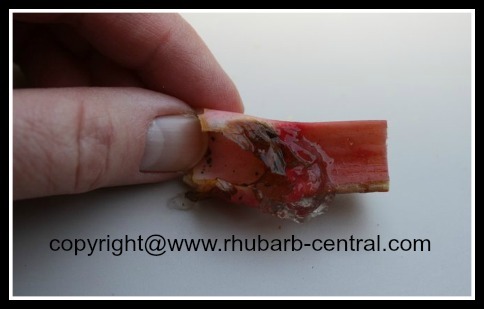 A small amount of damage like this can easily be cut off and discarded when processing your rhubarb. If you cannot identify the source of the problem, consult a plant specialist at your local garden centre, and, if possible bring a photo of the rhubarb stalk or leaf affected. Remember, seeing the damage will make it much easier for the professional to assess what is happening in your garden. If rhubarb pests have become a problem, when possible, treat your plants using natural and organic insecticides and pesticides, or make a slug trap. There are also conventional chemical herbicides which can be used for rhubarb. When treating garden plants, always remember to shield your crop from the contact sprays. Check with your local garden center for a recommended product. My rhubarb plant leaves often develop many very small holes in them. I believe this is due to aphids (For example, the "Black Bean Aphid") or other small insects. Large infestations of aphids may cause the rhubarb leaves to curl or wilt. "Flea Beetles" may cause damage to newly planted rhubarb by their feeding on tender rhubarb leaves. They become a rhubarb pest during periods of hot, dry weather. Since the leaves of rhubarb plants are poisonous, and discarded when the rhubarb is harvested, I have not found it necessary to treat the rhubarb leaves for these holes. Slugs are rhubarb pests that are commonly found on the stalks and occasionally on the leaves. The slug feeds at night, leaving damaged stalks and occasionally affect the leaves. Slugs may become a problem where there is poor soil drainage or heavy weed infestation. After harvesting rhubarb dispose of the leaves immediately, do not leave them to decompose alongside the rhubarb plants. Slugs thrive in wet areas and around decaying matter. If the edges of the rhubarb leaves are being eaten away (jagged edges) or there are large holes in the leaves, or the stalks have scars, the problem may be slugs (see image below). Slug and Snail "bait" can be purchased in the form of small "pellets" that poison the slugs. A more natural approach to controlling these rhubarb pests, is to make your own "slug trap". Making your own slug trap is a natural and inexpensive way to rid your rhubarb garden, (or any garden), of slugs (and snails). Slug bait can be purchased online at *Amazon.com. Click on the images below for more detailed product information, and customer product reviews. The "Rhubarb Curculio", (Lixus concavus), a yellowish member of the weevils, or "snout beetles" group is a pest which prefers rhubarb. These beetles are about 1/2" - 3/4" long. They typically bore their way into the stalks and crowns. Damage by these beetles is usually visible on the stalks (sometimes the leaves), with circular feeding and/or egg laying sites. The adult Rhubarb curculio overwinters in leaf litter or other similar sites and appears in mid-May. The adult makes feeding and egg punctures in the crowns, roots and stalks; a jelly-like sap substance exudes from the wounds, often with extraneous material trapped within (see image below). The best way to help avoid the Rhubarb Curculio from damaging your rhubarb is to ensure that there is no Dock Weed Plants in the area around your rhubarb garden. Dock Weeds are perennial weeds and a member of the Buckwheat Family of plants that grow 0.8 to 1.5 metres tall. They have a deep penetrating yellow taproot, and dark green leaves that are wavy and crisp along the margins. Dock Weeds turn a rusty-reddish colour when mature. Thistle and Sunflowers may also harbour these beetles. If your rhubarb plants have become infested with these snout beetles, use an insecticide or remove infected stalks and burn them to be sure to rid the area of these rhubarb pests. The "Potato Stem Borer" may become a rhubarb pest in midsummer. These caterpillars are about 3 1/2" long, and pinkish-white in colour. They bore into the rhubarb stalks. The adult moth lays their eggs on the stems of grasses in August, which in turn hatch the following spring. The best way to help avoid the Potato Stem Borer from damaging your rhubarb is to control the couch grass and other weeds in and around your rhubarb garden. If the weeds are controlled, the area becomes less attractive for egg laying by the adult moth. The "Tarnished Plant Bug" is usually a pest of new rhubarb plantings. The adult Tarnished Plant Bug is a light brown-reddish brown colour and about 5 mm in length. They occur throughout the rhubarb growing season and can damage rhubarb by feeding on young leaves. To help control the Tarnished Plant Bug, try to keep the areas directly adjacent to the garden free of weeds. Also, avoid planting rhubarb beside legumes. In some instances, in the spring, hungry wildlife may up-root rhubarb and eat the crowns, as stored starches are turned to sugars for new rhubarb leaf growth. I cannot think of an easier vegetable to grow in your garden than the rhubarb plant. 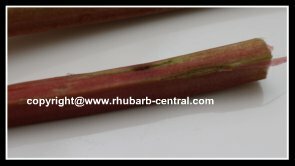 Here below, are links to helpful information about growing rhubarb in the home garden (or use the navigation bars). CONTAINER GARDENING - Can Rhubarb be Grown in Containers/Pots?